Having a grub problem in your lawn is pretty common for Georgia. We’re home to more insects than most of the USA, and larvae just come with the territory. 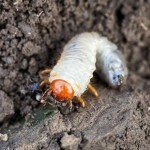 Unfortunately, the white grubs you’ll eventually see morph into June bugs and other beetles build up the energy to transform by munching on your yard’s root system. These creepy crawlers can do massive damage; so, make sure you treat them effectively. 1. Assume one grub is reason to panic. Georgia really is one of the buggiest of the 50 states. We’ve have more species of several types of insect than any other. Termites? Fire ants? Cockroaches? Mosquitoes? You name it. We’ve got it, and there’s no way to get rid of them entirely. 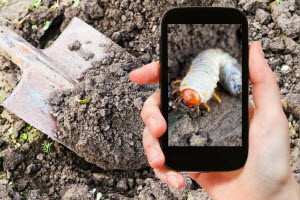 As much as it might creep you out to know, it’s normal to have a few grubs in your yard. A few aren’t enough to cause harm. Problems result when there are five or more grubs inhabiting a square foot of your lawn. So, if you find a single grub, grab a spade and dig up a small section and look for more. You may have nothing to worry about. 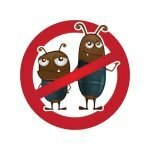 On the other hand, if you find 10 or more per square foot, you’ve run out of time to manage this grub problem in your lawn yourself and should speak with a lawn care specialist before you need to re-sod. 2. Assume cold weather will take care of your problem. Did you realize grubs can burrow into the ground? Like snakes or worms, they can go deep below the soil and protect themselves from freezing temperatures. Grubs can go up to a foot below the surface, and what do they live on? That’s right. All winter, they’re feasting on your yard’s root system. A large infestation can do enough damage to kill your grass off entirely, or at least make it weak enough for other problems to begin. 3. Assume thin, yellow grass will be the worst of your problems. Some homeowners don’t really care about the shape of their lawns. Chances are, they hate their neighbors, or maybe they’re just never home. If this is you, the idea of grubs taking out your grass may come as a relief. Less grass means less time spent mowing and the perfect reason to turn the yard into a rock garden. Unfortunately, things just aren’t that simple. Sooner or later, those grubs turn into beetles. There are many different kinds, but they’re pests, and they invite other problems to your yard. Bugs invite spiders, bats, raccoons and birds onto your property, along with a host of other invasive creatures. Investing in effective grub control can manage a wide range of problems. Have an out-of-control grub problem in your lawn? Let Think Green Lawn Care rectify it today. Call (678) 648-2556 to get a free quote to handle the grub problem in your lawn.